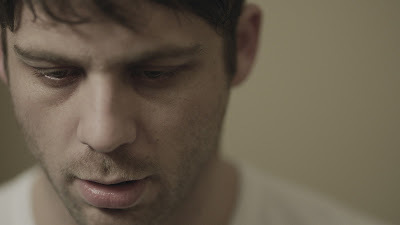 Writer/director Joseph Sims-Bennett’s new film Observance is being compared to Hitchcock’s Rear Window and Polanski’s Apartment Trilogy. While that is a huge compliment, it’s also a bit of a disservice to a film that simply cannot compete with those levels of storytelling. Lindsay Farris (Primal) plays Parker, a man grieving his young son, trying desperately to reconnect with his wife and drowning in hospital debt. All of this leads to him returning back to his private investigation career. Accepting a rather atypical job because it will be easy money, he quickly realizes that not everything is as it seems. Setting up in a dilapidated apartment that has newspapers covering the windows, a mysterious jar of black goo and an inordinate amount of animal carcasses, Parker watches Tenneal, the woman living in the apartment across the way. What starts out as a seemingly normal surveillance job, slowly becomes a downward spiral into….what exactly? That’s the main issue with Observance. Is this a paranormal film, a possession film, a study of paranoia and obsession or a commentary on grief? All of the above? Who the hell knows because none of these avenues are fully explored and if you’re looking for a film with a definitive ending, you aren’t going to find it here. Which is a real shame because the movie starts out strong. It sets a nice tone of claustrophobia and uncertainty and the real question behind why Tenneal is being watched is, initially, an intriguing one. Meanwhile, questions about the apartment that Parker is staying in begin to loom large. The simplicity and bleakness of the setting is wonderful and Farris does a stand up job of carrying the film on his shoulders, but the story lacks what appears to be crucial details. Perhaps more time could have been spent on filling in these holes rather than on the tired, worn out intercuts of visual wackiness that are meant to add an extra layer of eeriness and psychological depth, but ultimately feel like something that was already overdone two years ago. Another strange decision made with Observance is the setting. Despite being filmed in Australia, our leads speak with an American accent, which would lead one to believe this is taking place in America, but the movie, clearly, isn’t filmed in America. I don’t know about the rest of the world, but in America, apartment 128 is not directly across the alleyway from apartment 126. A few other things I have either never, or rarely ever seen in America are electric tea kettles and people putting milk in their tea. I’m not saying there is anything wrong with any of this; I’m simply stating how distracting this was. Also, they use land lines in lieu of cell phones. In this day and age, that is truly strange behavior. Tenneal does own a cell phone, though. In fact, she holds it in her hand while trying to escape via a door that has numerous locks. One would think that she would use the phone in her hand to call for help, but one would also assume that a lady who has just suffered a great loss wouldn’t leave her house in full hair and makeup either. The list of tiny distractions is long and that is not a good thing. While this all may sound exceedingly nit picky, this film relies on you staying in the tone and setting that it has created, so something as innocuous as a land line telephone is a bit distracting and that kind of kills the mood. Add to this the numerous story threads that not only never resolve themselves, but are also very similar to movies that have preceded this one and did a far better job at maintaining their escalating fear and dread AND had satisfying conclusions and you’re left with a movie that could have been so much more. 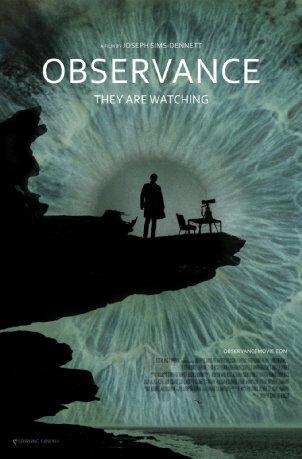 Observance is beautifully filmed, but it doesn’t quite seem to know what it wants to be, how it wants to present itself, where it takes place or how it ends and this leads to a wholly unsatisfying viewing experience.